Wing span: 3 7/16 - 4 7/16 inches (8.7 - 11.3 cm). Identification: Large. Upperside of male wings black at base, orange at outer portions; female black with blue on outer part of hindwing. Underside without typical Speyeria spot pattern. 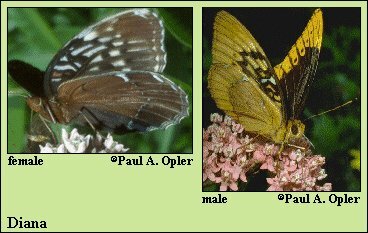 Life history: Males patrol for females in deep woods. Females walk along the ground laying single eggs on dead twigs and leaves near violets. The caterpillars hatch and overwinter without feeding. In the spring they feed on leaves and flowers of violets. Flight: One flight from mid-June to early September. Caterpillar hosts: Violets (Viola species). Adult food: Dung and flower nectar from plants including common and swamp milkweeds, ironweed, red clover, and butterflybush. Habitat: Fields, edges, and openings in moist, rich, forested mountains and valleys. Range: Ozark Mountains of Missouri and Arkansas; southern Appalachians from central Virginia and West Virginia through the mountains to northern Georgia and Alabama. Conservation: This species is extirpated from some former locations. Management needs: All populations should be monitored and those habitats on public lands and preserves should be protected.